This morning Tasha O’Neill, Artist, co-founder of the Space Studies Institute, SSI Senior Associate and widow of Gerard K. O’Neill, sent this note. We are very proud to share it with you. In Oct. 2013, I finally decided that it was time for Gerry’s papers to leave this house for a more permanent resting place. 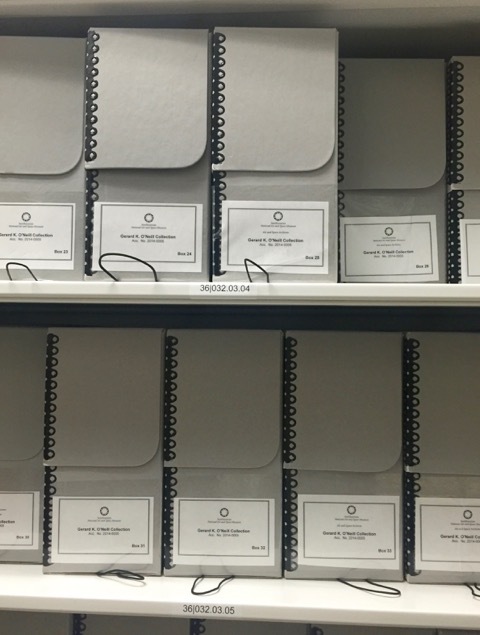 After Patrick McCray had finished the research for his book ‘The Visioneers’, I packed up 26 file boxes with Gerry’s papers and drove them to the Udvar-Hazy Center at Dulles Airport where they would be archived. The important thing to the family had been that ALL of his papers were accepted, covering all aspects of his distinguished career: Physics, Space, Geostar (and other entrepreneurial ventures), aviation, including articles, books, manuscripts, photographs and a screenplay about the High Frontier. Patrick McCray had made the introductions to his contact who would be championing the acceptance – Supervisory and Acquisition Archivist Patricia Williams. A few weeks after contacting her, the selection committee at the archives had determined that Gerry was worthy of being included. We drove to Washington Dulles Airport, were met at the gate and made our way down the taxiway that all aircraft now housed in the Museum had used, including the Space Shuttle and the Concorde. We were led down a ramp into a huge loading bay where staff was waiting to help us unload the Explorer. We were then escorted up to the archives, had the boxes counted and formally received. Patti gave us a tour of the archives including the cold chamber where some manuscripts are chilled for three days to kill any insects before they could do any more harm. She invited us to come back once the papers had been properly archived. 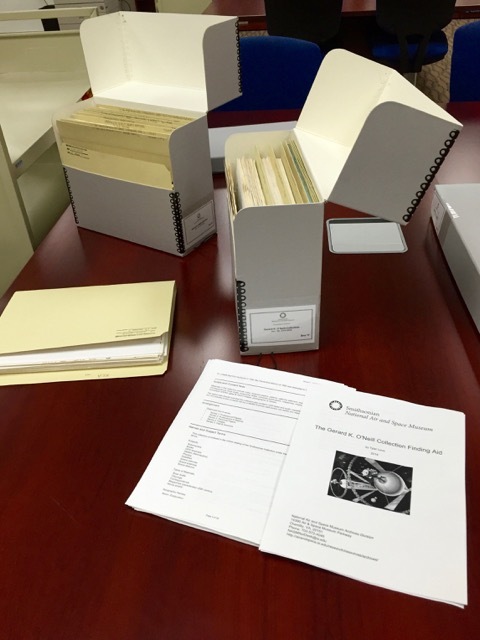 On April 19, 2016, we drove to Dulles where Patti Williams introduced us to Tyler Love who had actually preserved and archived Gerry’s papers. She was very complimentary of how organized they had been and how easy it was to maintain the order that Gerry had put them in. There were stories of how sticky notes can cause harm and what she did to preserve the paper and the content that had been covered up by the sticky notes. 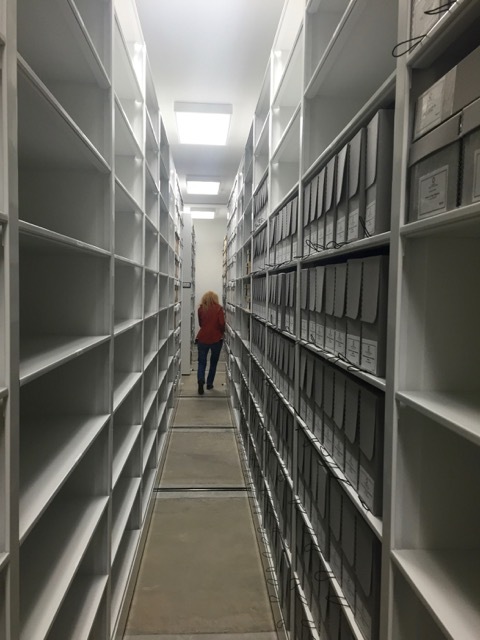 We toured the stacks and noted that 73 boxes occupy 10 shelves. I was pleased to see that Amelia Earhart’s was right next to his and the Saturn History Project Oral History Interviews as well. He is in good company. Enjoyed your book The Visioneers, Dr. McCray. A very good read. Glad that Jerry’s papers found a prestigious home. 40 plus years ago Carolyn did a painting of the interior of a space farm. I have managed to lose my photographs of that painting. If you still have it somewhere, I would really appreciate another photo, or better a digital photo. The O’Neill/Glaser ideas are still making progress. It’s about power satellites as a solution for CO2/global warming. I was a member of SSI from the very start, I believe, and had the privilege of attending a few events where Gerry’s vision of the High Frontier was presented with the “multi-media” format, such as it was in the late 60’s. It was exhilarating then and made so much sense to our membership, but could not find its way into the mainstream of space thought. It is refreshing indeed to see that now many of Dr O’Neill’s ideas are resurfacing and hopefully coming to fruition in the near future. I am very happy too that Gerry’s ideas have never dies and are being promoted again by the younger generation. All the best to you, and if you feel so inclined, we don’t want to lose your support at SSI. Hi Keith, thanks for commenting. So glad you are still pursuing solar satellite power and think that the presentation to the White House is excellent. Sorry, don’t have any knowledge of Carolyn’s painting. As a just-recently graduated aerospace engineer in 1975 I was fascinated enough by Gerry’s visionary ideas that I paid my own way to that year’s conference. He and SSI served as continuing inspiration that took me into industry as a devotee of space development, and later into space to personally pursue space industrialization aboard Space Shuttle. Best wishes and, belatedly, Happy Birthday! Thanks for telling me. You lived our dream!! It’s so heartening to hear how Gerry had influenced so many young people including you. What a legacy he left behind. Many may not go there routinely but quite a few have made it and will in the future.